Well Muttaburrasaurus doesn't exactly live in Hughenden but there is a life size replica of Australia's biggest dinosaur in the main street. 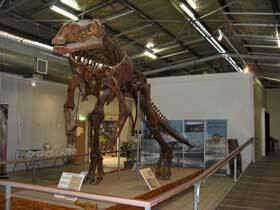 There is also a life size mounted skeleton in the Flinders Visitors Centre, along with other fossils and historical items from early Queensland settlement. Hughenden is located on the Flinders Highway about half way between Townsville on the Queensland coast and the famous mining town of Mt Isa. This whole area of north Queensland is famous for it's rich fossil beds. Muttaburrasaurus was first discovered at Muttaburra in 1963 by Doug Langdon while mustering stock along the Thomson River and is from a time when an inland sea covered much of central Australia. There have been many other fossil discoveries from this period, including the Lark Quarry Dinosaur Trackways at Winton and the Richmond pliosaur, Kronosaurus queenslandiscus which is known to have reached at least 12.8 m long. Kronosaurus Korner in Richmond is a Fossil Display centre which includes a working laboratory, an 8 minute theatrette presentation and audio guides for self guided tours. There are even fossicking sites about 12 km to the north of Richmond where you can try your luck, with a good chance of finding a fossil yourself. At Riversleigh there are also fossils in abundance, however these are from a different time, from about 25 to 15 million years ago. The fossils are very different too with ancient kangaroos, marsupial lions, tree-dwelling marsupial cats and other early marsupial species. 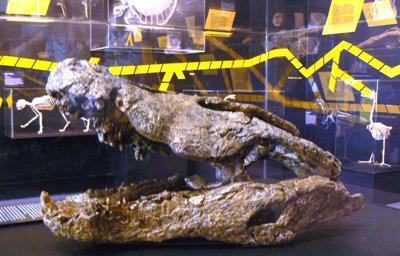 The Riversleigh Fossil Mammal Site was considered important enough to be included in the National Heritage List on 21 May 2007. In Mt Isa the Riversleigh Fossil Centre has many of these unique fossils on display. 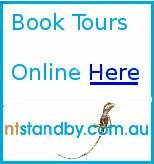 Travelling between Darwin and the East Coast can be an adventure on it's own if you have the time to follow the fossil trail. This is an extraordinary part of the Outback and well worth the time and effort.